A catch-up of the recording links for our webinars over the last few months. A recorded session in which we explored some of the features of Inkscape. A recorded session in which we explored and discussed some of the wealth of resources available online from major museums. In this recorded session Jo Freitag (@jofrei) talked with us about some of the characteristics of “giftedness” and shared many resources for educators working with gifted learners. Our most important sites to visit each day! This recorded session was led by Phil Hart (@philhart). Phil has extensive experience in coding (as a long term IT consultant, systems analyst and software developer) and is also an educator and so is well placed to recognise and share the characteristics of coding as a discipline. This recorded Serendipity session was wide ranging and we touched on a variety of topics including: what an online toolkit looks like, some potential future topics for FineFocus sessions and what makes a good picture. In this recorded session we took a look at some sites that might be described as “gamefied” and so could be engaging for students to access for learning purposes. Once again I am finally up to date with posting webinar links. Sorry again for the short session descriptions. Our next webinar will be an Edublogs “Serendipity” session on Thursday July 3 rd at 23:00 GMT/UTC (Afternoon/Evening USA) or Friday July 4th at 7:00 am West Aus, later in the morning Eastern States Aus depending on your timezone (check yours here) – in the usual BlackboardCollaborate room. This is one of our fortnightly unconference sessions where we invite you to bring along your “hot topics” and “burning issues”. We post these on the whiteboard and then choose the topic for discussion by poll. A digest of our recent webinars over the last few weeks. I am still hoping/planning to return to posting a fuller overview or each webinar every week. This was a fascinating, and very interactive, recorded session (the second of two). In the session @jofrei continued to share and discuss with us some of the myths about giftedness. Jo has recently posted a series about busting the myths on “Sprite’s Site”. some of the BlackboardCollaborate tools available to moderators and their potential usefulness for volunteer moderators at OZeLive. This week’s very different style of recorded session was a look at some of the pros/cons and possible uses for cheap tablets in the classroom. The session was facilitated by @philhart who reviewed a relatively cheap (AU$120) Android tablet and shared his thoughts throughout. This provided a “great” hook for discussion and enabled him to explore the practicalities of the device in response to points raised by participants. During the session there were also a number of ideas for classroom use discussed (particularly in a Kindergarten environment). We also briefly touched on some of the pros and cons of Android versus iPad for the teacher during which I shared my iPad screen through AirServer and AppShare. The consensus was that with careful research into the features provided there is lots of potential for using relatively cheap devices in a classroom environment to enable students to undertake varied activities. This was a totally fascinating session and is well worth catching the recording because of the very different style of session compared to our usual FineFocus. Our next webinar will be an Edublogs “Serendipity” session on Thursday March 6th at 23:00 GMT/UTC (Afternoon/Evening USA) or Friday March 7th at 7:00 am West Aus, later in the morning Eastern States Aus depending on your timezone (check yours here) – in the usual BlackboardCollaborate room. This is one of our fortnightly unconference sessions where we invite you to bring along your “hot topics” and “burning issues”. We post these on the whiteboard and then choose the topic for discussion by poll. As has been the case for the last few months I have not been able to post overviews each week. So this one is a digest of our webinars over the last few weeks. This recorded session was a Serendipity session in which considered two topics. We brainstormed some way of enthusing teachers to use technology in class and then moved on to think of “5 minute fun fillers” not necessarily involving technology use. As always this session was recorded. The session was based around content from a recent webinar that I did for our Western Australian State Adult Literacy and Numeracy network. One of the main curricula used for Adult Literacy in WA has recently been re-accredited and now includes many references to digital literacy and digital texts. So I have been presenting a short series of webinars to help adult literacy teachers think about how they might come to grips with the new requirements. In this recorded session in response to a participant question we took a look at blogging with a class of students, specifically how to get started in doing this with Edublogs. As always the session was recorded. We discussed and explored the terms PLN (Personal Learning Network) and PLE (Personal Learning Environment) and considered how these have changed for us as individuals over the last few years. In this recorded Serendipity session we looked at two topics. The first was a guided tour from @jofrei of a series of recent posts on her Sprite’s Site which followed the adventures of the Tweetlets during their Work Experience week at the Twitter Stream. Our second topic was a discussion of how we might be able to prepare training materials more efficiently. All four prompted lively discussion despite considerable agreement on each by the participants. To share or not to share, how do you decide? Our next webinar will be an Edublogs “FineFocus” session on Thursday Oct 10th at 23:00 GMT/UTC (Afternoon/Evening USA) or Friday Oct 2th at 7am West Aus, later in the morning Eastern States Aus depending on your timezone (check yours here) – in the usual BlackboardCollaborate room. In this session we will look at moderator tools from the presenter and session facilitator perspective. This recorded session was a FineFocus session in which @philhart took us on an exploration of the quality of information on the Internet. We shared our own concerns and Phil highlighted some of his. Phil also shared some the ways he assesses/evaluates the quality/credibility of information he finds and invited us to share our strategies. Who gives PD to those who give PD? (this extended into a look at the ways we access PD). One of our semi-regular FineFocus recorded sessions in which we explore a few apps with similar purposes and share our ideas on their ease of use, potential for engagement and possible use with students. These sessions are always great fun and very practical as we each find out about a different tool and then share our thoughts. This was another recorded session facilitated by Jo (@jofrei) and Sandra (@Marndon). Both the other Jo and Phil went AWOL to present at a conference! The topics explored were digital stories and ideas for “five minute fun fillers” for whiteboards. In this recorded session we discussed why or why not we each used one or more of “the big four” social media platforms and also looked at our activity levels and our particular likes/dislikes for each of them. My apologies for the very short topic descriptions! I hope to return to more complete overviews soon! Our next webinar will be an Edublogs “Serendipity” session on Thursday Aug 1st at 23:00 GMT/UTC (Afternoon/Evening USA) or Friday Aug 2nd at 7am West Aus, later in the morning Eastern States Aus depending on your timezone (check yours here) – in the usual BlackboardCollaborate room. This is one of our fortnightly unconference sessions where we invite you to bring along your “hot topics” and “burning issues”. We post these on the whiteboard and then choose the topic for discussion by poll. This recorded session was a FineFocus session in which I used “AirServer” and BbC App Share to share, very briefly, some of the iPad apps I have on my iPad. This prompted great discussion, and sharing of apps they use, by other participants. A very lively session – recorded as always in which our focus was on multiliteracies. We also touched briefly on: innumeracy in primary school teachers, vulnerabilities to hacking in some hosted blogging platforms and the best time of year to hold online conferences. A FineFocus session in which we took a look at some of the small tools and tricks that make our lives easier. This was a great recorded session with some terrific tools and tricks shared. We all have little things that we use to help us streamline our busy lives and it is always useful to find out what others use. My apologies for not the very short topic descriptions! I hope to return to more complete overviews from the FineFocus mentioned below which was yesterday, and was “If it’s on the Internet it must be true!” with Phil Hart. I hope to publish the overview & recording link for that one tomorrow. Our next webinar will be an Edublogs “FineFocus” session on Thursday June 27th at 23:00 GMT/UTC (Afternoon/Evening USA) or Friday June 28th at 7am West Aus, later in the morning Eastern States Aus depending on your timezone (check yours here) – in the usual BlackboardCollaborate room. Over the last few weeks I have fallen very behind with overviews so this week is a double overview for four recent webinars. There will be less detail than usual about each webinar because I feel it is important to share the links which I have not yet done rather than write detailed overviews. This recorded session was a FineFocus session in which we explored some of the online “sticky note” walls available. We started as we so often do with “where are you coming from” on the topic questions. These elicited that all but one of us had used sticky wall notes at some time. We finished up with an opportunity to share our own preferences – several links had been shared earlier via text, a look at our “take-aways” from the session and some quick feedback! Hacking – concerns about our devices and information being accessed unbeknownst to us. This topic gave rise to the following week’s FineFocus – see below. “Technology terrorising teachers – does it? what can we do about it? As always time went too fast and it was the end of the session! This was a terrific recorded session by @philhart (when he isn’t teaching Phil is a freelance computer consultant) who gave us a very thought provoking insight into the risks we take every time we connect to the Internet, and into some of the strategies for reducing these risks. Phil dis a great job of demystifying some of the jargon. He also made the point strongly that there is no complete answer – all we can do is be vigilant. I certainly came out of the session with much greater knowledge and awareness than I had when I went in! I would suggest catching the recording to anyone who has any concerns about online security – and really this should be everyone! These were great sessions and my apologies for not doing them justice in the overviews! Our next webinar will be an Edublogs “FineFocus” session on Thursday May 30th at 23:00 GMT/UTC (Afternoon/Evening USA) or Friday June 1st at 7am West Aus, later in the morning Eastern States Aus depending on your timezone (check yours here) – in the usual BlackboardCollaborate room. Edublogs Serendipity webinar overview – just a chat! This recorded Serendipity session was really just a chat rather than a more formal session. There were only three of us so we just talked about the ideas we had on the whiteboard and digressed into other areas. The ideas on the whiteboard for this week were “Crowdfunding” and “Teaching basic numeracy in primary schools”. However we diverted into several other areas. Our next flying visit was to the concept of crowdfunding – what it is and some potential issues around copyright and Creative Commons licensing that might arise with crowdfunding online projects. Then we talked about the accessibility, or lack of accessibility, to outcomes from gifted education research. This being largely because such research is published mainly in journals that are expensive to access. The discussion expanded into comment on the pressure to publish now on academics. We also diverged into issues around obtaining recognition (eg for blogs) and funding for projects in areas that are perceived as of interest only to minorities. We finished with a short discussion about maths with particular reference to teaching in primary school and student confidence issues. A slightly different Serendipity this week but still as always engaging and interesting! Our next Webinar is a FineFocus session. Join us on Thursday May 2nd at 23:00 GMT/UTC the time for you will vary depending on your timezone (check yours here) Thursday afternoon/evening in the USA, late night Thursday in Europe, and Friday morning May 3rd in Australia – in the usual Blackboard Collaborate virtual room. This session – recorded as always was a FineFocus session in which we took a learning styles by exploring some of the online learning style inventories available and discussing their usefulness. We started with a couple of “where are you coming from” type questions. 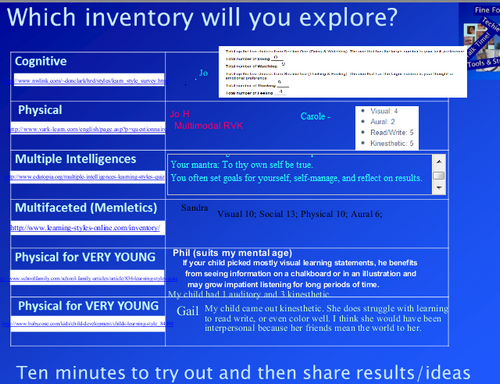 These elicited that we had all at some point both completed an inventory ourselves and also used one with students. Overall this session was fun – because we all had prior knowledge of Learning Style Inventories we were able to discuss them in more depth than if they were new to most of us. Also it is always very satisfying to go and try something out during a session and share the outcome. Most people enjoy finding out something about themselves and this session gave us the opportunity to do so! Our next webinar will be an Edublogs “Serendipity” session on Thursday April 25th at 23:00 GMT/UTC (Afternoon/Evening USA) or Friday April 26th at 7am West Aus, later in the morning Eastern States Aus depending on your timezone (check yours here) – in the usual BlackboardCollaborate room. This is one of our fortnightly unconference sessions where we invite you to bring along your “hot topics” and “burning issues”. We post these on the whiteboard and then choose the topic for discussion by poll. 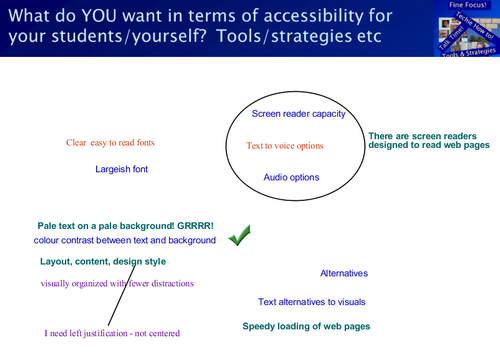 This recorded session was a FineFocus session in which we took a brief introductory look at Accessibility Standards. The topic is one that is becoming increasingly prominent as governments around the world set accessibility compliance standards for government websites. We started with a poll and a whiteboard to find out where we were all coming from on Accessibility Standards and their application in an online/e-learning context. This revealed varying knowledge and so provided great opportunities for discussion as we continued through the session. We moved on to look at the sorts of things that we, both as individuals and in the context of meeting our students’ needs, felt made websites more accessible. The next part of the session was a brief look at the links and possible conflicts between Universal Design for Learning (UDL) and Accessibility Standards. We also took a very quick look, via App Share, at the guidelines that have been derived from the standards. I must admit that when I first looked at the guidelines I went into panic mode! I am reasonably tech savvy and I was totally daunted by the impossibility of making every piece of e-learning I develop totally compliant. I think that others in the session felt similarly – having had time to reflect my response is that I will do what is feasible and take baby steps. One of my main concerns is that this will all be too hard for the average practitioner who is only beginning their journey into developing online content and that the result will be a return to boring text only documents uploaded as documents and lacking interaction. We also considered the impact on others (not falling in to defined equity groups) of changes made to meet the needs of specific equity groups. We compared some of the old Elluminate buttons/features with the new BbC ones that were developed through very close consultation with equity groups. Finally we discussed some ways we might make a start on improving accessibility in our own practice – including checking foreground and background for colour contrast. Although it wasn’t one of those suggested I have made a change in my blog theme moving to a “responsive theme” ie one that is “mobile friendly” and adapts itself to the device type so that the text is readable without zooming. I made the change because fortuitously I saw this post by @suewaters – on “theedublogger” and it nudged me into making the change. I don’t like my new theme as much as the old one – I would probably have stayed with it forever given the opportunity, but I think it is good that I made the change! We finished with a page of links, “takeaways” and feedback. This was a really interesting session partly because we all came from very different amounts of prior knowledge which always gives rise to great discussions. Also our varied backgrounds enabled us to bring different perspectives – one of the best things as always for me was hearing/seeing the ideas and opinions of others in the group. Our next webinar will be an Edublogs “Serendipity” session on Thursday April 11th at 23:00 GMT/UTC (Afternoon/Evening USA) or Friday April 12th at 7am West Aus, mid morning Eastern States Aus depending on your timezone (check yours here) – in the usual BlackboardCollaborate room. This is one of our fortnightly unconference sessions where we invite you to bring along your “hot topics” and “burning issues”. We post these on the whiteboard and then choose the topic for discussion by poll. Edublogs Serendipity webinar overview – cool tools and other things! 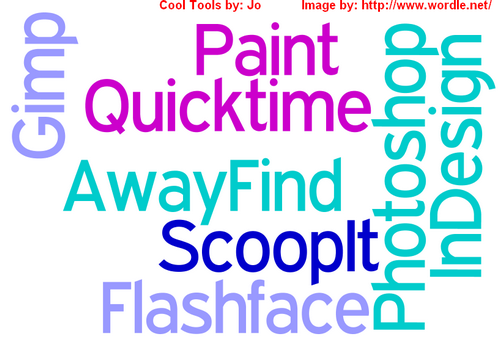 In this recorded Serendipity session our chosen topic was “cool new tools” – although this extended to cool tools, not necessarily new, that we use! We also decided to take a look at some of the other suggestions if time allowed. We had some new tools shared and also some old favourites. Always interesting to find out what everyone else is using and often even more interestingly HOW they are using it. We had a great conversation around these tools and how/why we use or in some cases don’t use them! One of the best things about Serendipity is that we often look at more than just the one chosen topic. This gives people an opportunity to share briefly what is currently on their mind and get input from others. In this session we talked about the pressure imposed by assessment and reporting requirements, and an interesting sidelight on the need to translate a report into a parental first language. Yet another pressure that would not have existed 30 years ago! The topic of free live conferences was also discussed briefly – there are now many of these globally but not at the moment one that is at generally Australia friendly times. (Most of us in the session were Australia based). A great session – Serendipity is always fun and enlightening! Our next Webinar is a FineFocus session. Join us for “Accessibility Standards?” in which we take a look at some of the issues around accessibility of e-learning content and some of the standards introduced to try and make it more accessible. Join us on Thursday April 4th at 23:00 GMT/UTC the time for you will vary depending on your timezone (check yours here) Thursday afternoon/evening in the USA, late night Thursday in Europe, and Friday morning April 5th in Australia – in the usual Blackboard Collaborate virtual room.